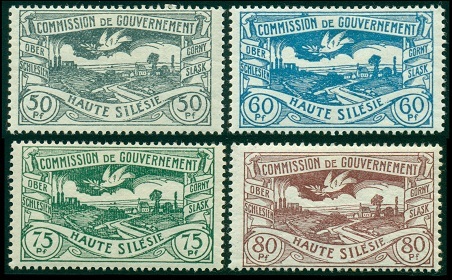 The Upper Silesia plebiscite territory, or French: Commission de Gouvernement Haute Silesie (Commission of Government / Upper Silesia), began issuing postage stamps in 1920. 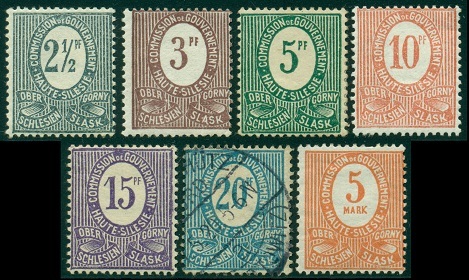 Nine new Upper Silesia stamps were printed in Paris and issued on February 20, 1920. The designs feature the denomination in a white oval, with the name of the territory in French, surrounding the oval. Ribbons at the lower left and lower right indicate the names of the territory in both German and Polish. All of these new stamps, except for the 50 Pf. and 1 Mk. denominations, are shown above (Mi. #1-9, Sc. #1-9). Due to the type of printing of these stamps in large sheets consisting of panes separated by gutters, these can be collected in horizontal and vertical gutter pairs and in gutter blocks. See the Michel Deutschland-Spezial-Katalog for details. 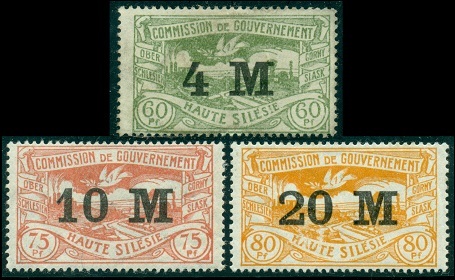 The three major-type re-valued denomination stamps shown above (Mi. #10-12, Sc. #10-13) were issued between March and May of 1920. The 5 Pf. re-valuation comes in five types, the 10 Pf. re-valuation comes in four types, and the 50 Pf. re-valuation comes in seven types. These numeral types and all their many varieties are described in the Michel Deutschland-Spezial-Katalog. The seventeen new definitive postage stamps for the Upper Silesia plebiscite territory shown above (Mi. #13-29, Sc. #15-31) were issued between March and April of 1920. The new designs depict a dove of peace flying above a Silesian landscape. These stamps can also be collected as gutter pairs and blocks, and there are many known plate faults that are noted in the Michel Deutschland-Spezial-Katalog. To celebrate the plebiscite held on March 20, 1921, the 10 Pf. through the 1 Mk. 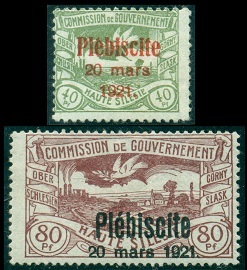 denomination stamps of the previous definitive stamp issue were overprinted with "Plebiscite / 20 mars 1921" in various colors (Mi. #30-40, Sc. #32-42). Examples of two of them are shown in the image above. 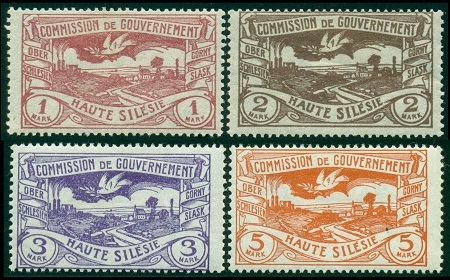 The three re-valued postage stamps shown above (Mi. #41-43, Sc. #45-47) were issued on March 6, 1922. 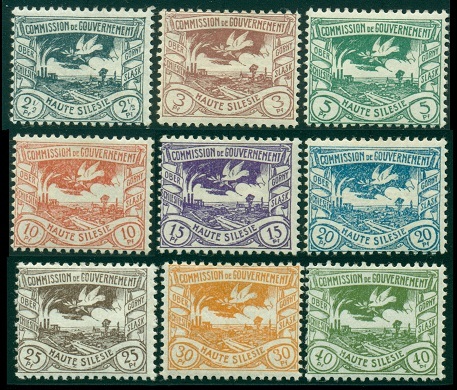 The stamp designs themselves were also printed in different colors from those of the same denominations of the 1920 original postage stamps.